Though Rep. Camp's tax plan is highly unlikely to become law this year, retirement planning advocates weighed in. Before House Ways and Means Committee Chairman David Camp, R-Mich., could reveal on Wednesday his plan to overhaul the tax code, Senate Republicans nixed any chance of passage of tax reform this year. Indeed, Senate Minority Leader Mitch McConnell, R-Ky., is quoted as saying Tuesday: “I don’t see how we can” advance tax reform this year. Political strategists say Republicans are already taking issue with Camp’s plan, since it hikes taxes on the rich and banks, eliminates the lower tax rate on carried interest and would get rid of popular tax breaks. Camp said that his plan would not change how the tax code treats the money Americans have already saved. Going forward, it would maintain the 2014 contribution limits for individual retirement accounts and for defined contribution plans, like 401(k)s.
“Today, when saving for retirement, a taxpayer decides whether to put the money away for retirement after taxes and save tax-free (Roth accounts), or put the money away tax-free and then pay taxes when they withdraw the funds during retirement (traditional accounts),” Camp said. For future contributions, Camp’s plan allows up to $8,750 (half of the contribution limit) to be contributed either to a traditional or Roth account. This is just part of the message that he and other IRI executives were delivering Wednesday during their meeting with more than two dozen lawmakers. Providing a significantly more generous standard deduction so that 95% of taxpayers will no longer be forced to itemize their individual tax deductions. Reducing the size of the federal income tax code by 25%. Camp’s plan also reduces and collapses today’s brackets into two brackets of 10% and 25% for virtually all taxable income. More than 99% of taxpayers face maximum rates of 25% or less. The plan would also impose a 10% surtax on certain types of earned income over roughly $450,000 a year, hitting salaried professionals but not the super-rich, whose income often is derived primarily from interest and investments. 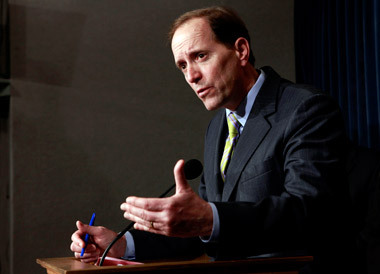 The Joint Committee on Taxation has already analyzed his plan, Camp said, and estimates that “after this streamlining of the tax code, the size of the economy will increase by $3.4 trillion over the next decade, or roughly 20% compared with today.” This will lead to nearly 2 million new jobs — and producing up to $700 billion in additional federal revenues that can be used to lower taxes even further or reduce the debt. If tax reform doesn’t occur this year, Joe Lieber of Washington Analysis predicts that Camp’s blueprint will no doubt be used as “a template” for the next Chairman of the Ways and Means Committee, which Lieber said is “widely expected” to be Paul Ryan, R-Wis. “Of course, his proposal will differ from Camp’s, but many provisions will likely be similar,” Lieber said. Indeed, Mike Nicholas, CEO of Bond Dealers of America, released a statement that BDA is concerned about several provisions of Camp’s plan including the implementation of a 10% surtax on tax-exempt bond interest income and outright elimination of advance refundings and private activity bonds. “BDA member are especially concerned about how this will impact the ability of state and local governments to finance critical public infrastructure projects like highways, hospitals, and water treatment facilities, by driving up borrowing costs and increasing state and local taxes,” he said. Check out the discussion draft of Camp’s tax plan. Read Changes Afoot in Washington Well Ahead of Midterm Elections on ThinkAdvisor.